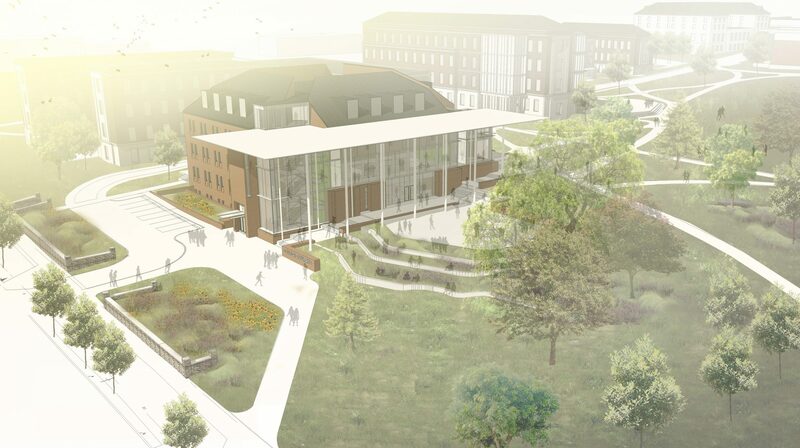 SFA was commissioned by the Pennsylvania State University to complete a program evaluation, phased master plan, and schematic design for the College of Nursing. The overall goal is to create a hub for nursing education in the local community and in Pennsylvania. SFA was commissioned by the Pennsylvania State University to complete a program evaluation, phased master plan, and schematic design for the College of Nursing. It is important for the building to present a face to the community, and become a gateway for health and wellness. The overall goal is to create a hub for nursing education in the local community and in Pennsylvania. Spillman Farmer evaluated the programming and optimal layout, assessing existing conditions and infrastructure upgrades, creating a phasing plan, and developing visioning and schematic design. Building renovations will include classrooms, laboratories, faculty offices, a community clinic, several multi-purpose gathering spaces, and an auditorium. The proposed phasing strategies will be based on the reconfiguration of building circulation, as well as the fact that the building needs to remain primarily online throughout the renovation process.